Ashish studies for 4 hours, 5 hours and 3 hours on three consecutive days. How many hours does he study daily on an average? Thus, Ashish studies for 4 hours on an average. A cricketer scores the following runs in 8 innings: 58, 76, 40, 35, 48, 45, 0, 100. (ii) Range of marks obtained. (i) Clearly, the highest mark is 95 and the lowest is 39. (ii) The range of the marks obtained is: (95 – 39) = 56. Hence, the mean mark of the students is 72.9. Find the mean enrollment of the school for this period. Thus, the mean enrolment of the school for the given period is 2059. (i) Find the range of the rainfall from the above data. (iii) Clearly, there are 5 days (Mon, Wed, Thu, Sat and Sun), when the rainfall was less than the mean, i.e., 5.87 mm. If the heights of 5 persons are 140 cm, 150 cm, 152 cm, 158 cm and 161 cm respectively, find the mean height. Find the mean of 994, 996, 998, 1002 and 1000. The first five natural numbers are 1, 2, 3, 4 and 5. The first five multiples of 3 are 3, 6, 9, 12 and 15. 64, 36, 47, 23, 0, 19, 81, 93, 72, 35, 3, 1 Find their mean. 2, 4, 3, 4, 2, 3, 5, 1, 1, 5 Find the mean number of children per family. Thus, on an average there are 3 children per family in the locality. Thus, the incorrect sum of the observations = 40 x 100 = 4000. So, sum of the five numbers = 5 x 27 = 135. So, sum of the four numbers = 4 x 25 = 100. → The excluded number = 135 – 100 = 35. Let the weight of the seventh student be x kg. Thus, the weight of the seventh student is 61 kg. 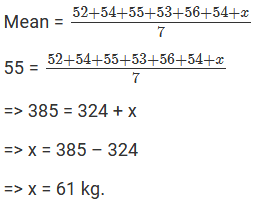 The mean weight of 8 numbers is 15 kg. If each number is multiplied by 2, what will be the new mean? →x1 + x2 + x3 +…+ x8 = 120. Let the new numbers be 2x1, 2x2, 2x3 …2x8. Let M be the arithmetic mean of the new numbers. 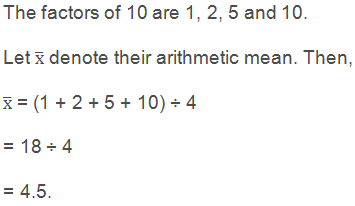 Now, if one number is excluded, then their mean is 16. ∴ Sum of four numbers = 16 × 4 = 64. 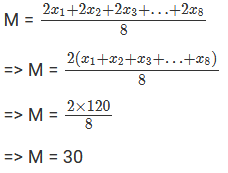 ∴ The excluded number = 26. The mean of 200 items was 50. Later on, it was discovered that the two items were misread as 92 and 8 instead of 192 and 88. Find the correct mean. → Sum of the observations = 50 x 200 = 10,000. → Correct sum of the observations = 10,180. The mean of 5 numbers is 27. If one more number is included, then the mean is 25. Find the included number. → Sum of the five numbers = 27 × 5 = 135. → Sum of the six numbers = 25 × 6 = 150. → The included number = 15. The mean of 75 numbers is 35. If each number is multiplied by 4, find the new mean.